Jonny Lang's top 5 tips for guitarists: "Think of solos like a conversation"
Much like the modern-day king of modern blues himself, Joe Bonamassa, American singer/guitarist Jonny Lang started making waves as a young teen, releasing his debut album Smokin not long after his 15th birthday. In the time since, he’s gone from strength to strength, becoming one of the main protagonists for a new generation of swampy shuffle and turnaround worshippers, with five albums having invaded the Billboard top 50 and 2006’s fifth full-length Turn Around even scooping a Grammy. “It will be a five-piece band including me,” he tells MusicRadar, in his quietly polite and almost shy Cass County drawl. “My current line-up includes Barry Alexander on drums, Zane Carney on guitar and Tyrus Sass on keys, so it should be a lot of fun. Some people can use just one guitar and make it sound like anything. Other people need more, I guess! “Most of this last record was done using this old five-watt National amplifier. I don’t really recall using any pedals; if I did, it was only on a couple of occasions. Most of what you’re hearing is that amp on full and one of my two main guitars. “I’m not sure if I’ve given it much thought, in terms of quantifying the whole musical experience. I just love it and really mean it. That’s the main thing, in terms of what I’m doing, is to feel it and mean it. And in order to do that, I find it comes down to how many words you know in the language of music. “I definitely think I approach my lines more like a vocal melody, for sure. I think of solos like a conversation. I’m sure there’s a famous BB King quote saying something similar. And they should be conversations that make the song better, rather than just being a solo in between vocal parts. “When it comes to vibrato, I’ve always looked up to BB King and Albert Collins. And, come to think of it, Albert King! There are so many different types of vibrato out there, but those three are the ones who have always been my favourites. “And in terms of great guitar players that are still alive, there are still many that are important to blues music. Buddy Guy is a big one for me; he’s probably the guy right now when it comes to the proper legends. “I remember seeing him play at some point early on in my career, just watching him go crazy on stage. He wasn’t thinking about it at all. That’s what made me realise it’s okay to be reckless when you play music. That’s perfectly fine. It can actually help push you into a different place - that guy is the master of that. He’s amazing. “One of the thoughts we had going into this latest record was making sure we didn’t overly cut tracks and beat the songs to death. If it wasn’t happening for whatever reason, we’d ditch it and move on and try something new. “Okay, some mistakes can be a little too drastic, but it can be nice to leave a little edge on things and can make for a better all-round picture or sense of what you are doing. Those imperfections can be the best parts of a recording! “Even when it comes to my tone, I actually prefer the less-perfect room sounds. In the studio I will have a microphone up close to the amp and usually at least one more further away, by several feet or more. And I’m pretty heavy on that in my final mix - it brings this warmer tone with the directness and treble of the close-up sound rolled off. “I’ve got to give credit to our engineers, as well as [Nashville production team] Drew and Shannon. They were responsible for a lot of those great tones on the record Having the right engineers and co-producers were a big help on this last album, more than the list of equipment. 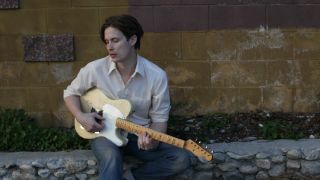 Jonny Lang co-headlines Rockin' The Blues with Walter Trout on 4 June at The O2 Forum Kentish Town, London.